RAPAPORT... In celebration of the 2012 Jewish High Holy Days of Rosh Hashanah and Yom Kippur, Embee Diamond Technologies of Prince Albert, Saskatchewan released its Magen David Diamond Cut© for industry use as a gift to the global diamond trade. 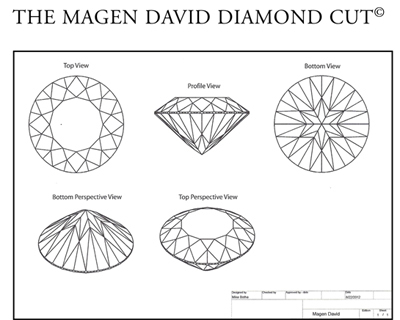 Any suitably equipped manufacturer is welcome to cut, polish and sell this diamond so long as they agree to make a charitable donation of a 1 percent royalty to Magen David Adom (www.mdais.com/MDA_friends), according to the company. Magen David or Star of David or Shield of David is renowned as the symbol of Judaism and it is affixed to the pavilion of this diamond so that its reflection is clearly visible within the table as well as throughout the entire stone. The design of this round brilliant diamond was created by the founder of Embee Diamonds, master diamond cutter Mike Botha, with a high degree of craftsmanship to exhibit top optical performance. Botha, a pioneer of modern diamond cutting, has more than 45 years of experience at the workbench and a decade of training Canadian nationals to craft diamonds in Yellowknife, Northwest Territories. In 2006, he launched a full constellation of patented Sirius Star™ diamond cut designs. The Sirius Star design concept is simple yet elegant; even when perfectly cut, the standard shapes of diamonds are asymmetrical. The tops of these diamonds have stars, mains and girdle facets. The bottoms have only mains and girdle facets. Botha added bright stars on the bottom. The original Sirius Star™ 80 has an eight-pointed star at its heart, the Sirius Star™ 100 has a 10-pointed star, the American Star© has a five-pointed star, and now the Magen David Diamond Cut© with its six-pointed star belongs to the world. what are the benefits features? Thank you Joe. I will pass your message on. We applaud you, Mike, on your gracious gift to the industry and the world.